Most online casino operators know how difficult it can be to start a new platform and try to make it successful. The competition in this sector is fierce. However, if things are done right, then you’re almost bound to be liked by the majority of online gamblers. Wild Casino only opened its doors slightly earlier on in 2018, but it has been gaining a following ever since. As soon as you load the website up for this site, you’ll start to understand why. 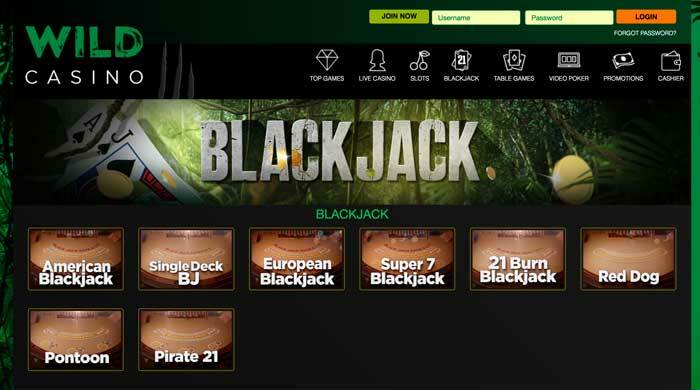 Everything is very nicely designed, invoking a wild theme throughout and providing a visually appealing location to play your favorite casino games. Furthermore, the site comes with easy-to-use functions, ensuring that you’re able to navigate around easily. The Wild Casino platform bases itself out of Panama, which therefore also means that it has to hold a gambling license from the same jurisdiction. It is with this license that it is able to provide a safe and secure casino environment. Therefore, your gameplay will take place in a fair and regulated location. You won’t find any details relating to this license on the site itself, but it does possess such. Further to this, anyone who wishes to become a member of the Wild Casino will also be able to play its games from a mobile device. This includes both smartphones and tablets. The only thing that you need to do to access this is enter the website’s address into your device’s web browser, and the optimized version of the casino will show up for you. Everything is much more compact on your screen, meaning that you’ll be able to benefit from high-quality graphics and a mobile site that is just as easy to use as the desktop version. Even though everything looks very appealing at Wild Casino, the site doesn’t cater to all countries around the world. Because it only holds a gambling license from the jurisdiction of Panama, it cannot legally provide online gaming to residents of the United Kingdom. Additionally, certain other countries aren’t able to play there, either. However, on the flip side of the coin, US gamers are very much welcomed to Wild Casino. 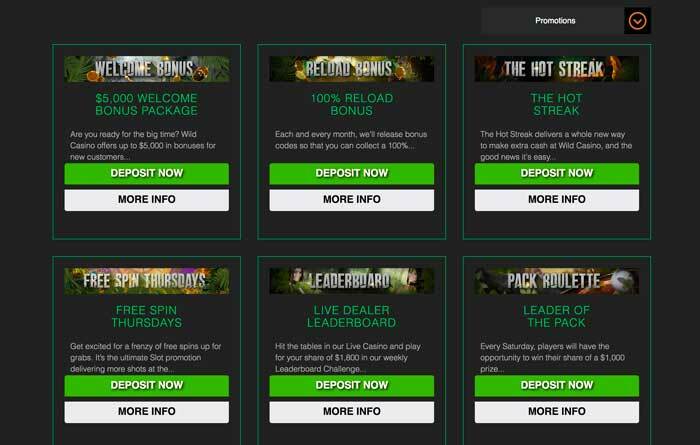 The Wild Casino platform has its own selection of promotions to provide to its players. These begin from the moment that you become a new player following your sign-up. The welcome bonus that is on hand consists of a total of $5,000 in bonus money. To receive this, you need to simply make your first deposit, and you’ll receive a 100% bonus to use on the slot games. Just be sure to use the bonus code of WILDSLOTS, and you’ll get up to $1,000. This same code can be used on top of your first three deposits, allowing you to receive up to $3,000 in total. Then, on your fourth deposit, you can use the code TABLE100 and receive 100% up to $1,000 to use on the site’s table games. Finally, moving on to your fifth deposit, you just need to use the bonus code of VIDEO100, and you’ll be given a 100% bonus up to $1,000 for using on the casino’s video poker options. This does make the welcome package quite the diverse and appealing offer. As long as you make a minimum deposit of $20 on each of these deposits, you are eligible to claim the bonus funds on top. For the slots bonus, this comes with a wagering requirement of 30 times the bonus and deposit amount. For the video poker bonus, you need to complete wagering requirements of 60 times the bonus and deposit amount. In the case of the table games bonus funds, you’ll have to complete wagering requirements of 80 times. 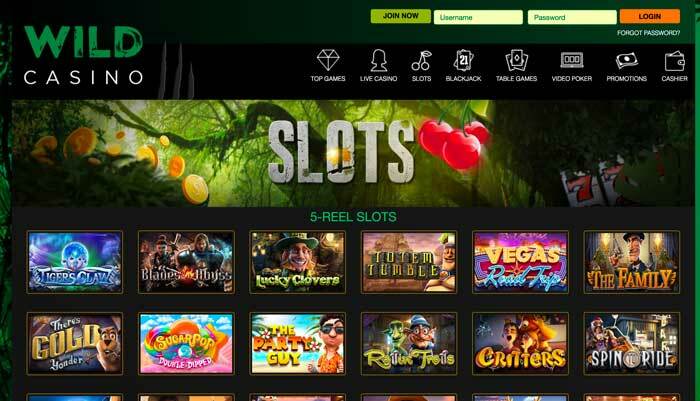 Perhaps the place where Wild Casino is at its most vulnerable is in terms of the payment methods that can be used for depositing and withdrawing. While it’s not all doom and gloom, the site does have very few options that are available to you to use. On the plus side, you can make use of three different cryptocurrencies for depositing with. Those are Litecoin, Bitcoin, and Ethereum. All of these give you the chance to deposit anywhere from $20 up to $25,000 altogether. You can also make use of a bank check instead, which allows you to deposit up to $15,000, but not less than $1,500. If you’d prefer to use a credit or debit card, Mastercard and Visa are accepted, although the deposit needs to be at least $50 and no more than $5,000. You’re also able to take advantage of making a deposit via bank wire transfer, which doesn’t have a maximum limit to it. Finally, money orders are accepted by Wild Casino, for maximum transfers of $9,000 altogether. When you’re ready to withdraw funds from your casino account, there’s still only a small number of withdrawal options on hand. The three cryptocurrencies are available to use again, and these afford you a maximum withdrawal of $10,000. You can also choose to take your winnings out by using a bank wire transfer, which allows you to take out up to $24,900 per week. This option can take up to 15 business days to complete. Otherwise, the only other option is to take a Bank Cheque Express pay-out. These are delivered to you within seven business days and have a withdrawal fee of $50 attached to them. You’re able to receive one of these for up to $2,500 in total. Therefore, if you’re looking for instant deposits and withdrawals, the best choice is to go for one of the cryptocurrencies, as far as Wild Casino is concerned. Should You Play at Wild Casino? 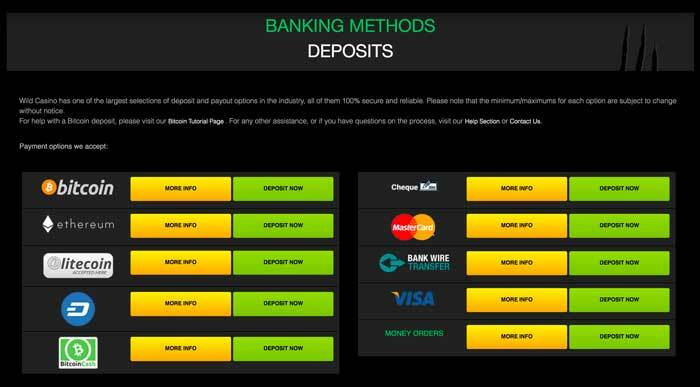 If you can get past the small choice of banking methods that the site accepts, then Wild Casino is definitely a location to enjoy and sign up to. It has a very appealing website layout on offer, and it provides you with ease of access to some of the best online casino games. Not only that, but there’s a very strong welcome offer for you to accept, which covers your first five deposits there and allows you to receive up to $5,000 altogether. It must be said that a casino without licensing information does give us somewhat of a red flag. After all, many online gamblers like to know that they’re depositing funds and playing at a legal and regulated platform. 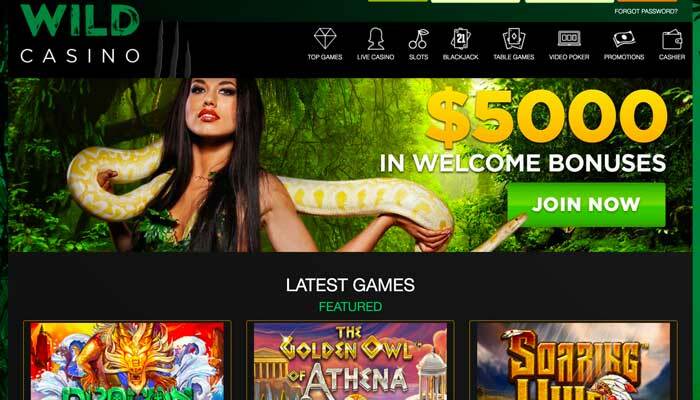 Yet with the inclusion of a mobile version of the Wild Casino and a strong choice of different games to play, it does push through to the forefront with a lot of attractive features. Overall, we’d say that Wild Casino is a fascinating location to enjoy spending some time and funds on a plethora of exciting games.